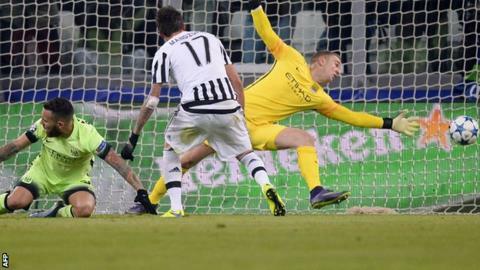 Juventus joined Manchester City in the Champions League knockout stages by beating Manuel Pellegrini's men to move top of Group D.
Fernandinho blasted over from close range for the visitors before Mario Mandzukic volleyed last season's losing finalists ahead soon after. Fernando had a header tipped onto the post for City after the break, before Stefano Sturaro hit the post for Juve. Substitute Raheem Sterling squandered a golden chance to equalise late on. The Italians will now finish top of the group if they win at Sevilla in their final match. Manchester City's miserable night was compounded when goalkeeper Joe Hart was replaced late on because of injury. Are City ready to challenge in Europe? Pellegrini has overseen City's previous best Champions League campaigns by reaching the last 16 in the past two seasons. But, having qualified for the last 16 with ease this time round, City are yet to prove they are ready to establish themselves among Europe's elite. Having been hammered 4-1 at home by Liverpool in the Premier League on Saturday, they reacted positively by matching the Serie A champions for long periods. They had lots of the ball, created several chances against a usually solid Juventus, and would have earned a point had Sterling been able to turn home from about six yards. The worry remains defensively for City as, like in past seasons in Europe, they were cut open too often by their opponents - albeit with a number of players missing. The only goal saw the visitors caught with too many men forward, not for the only time, and that is something you cannot afford to do in the latter stages. How important is finishing top? Manchester City had already qualified from the group but the importance of finishing top cannot be underestimated. Finishing second the past two years cost them as being drawn against Barcelona both times meant the end of their tournament. Top spot means you avoid playing against the other group winners in the next round, including Bayern Munich, Real Madrid and Barcelona. Defeat in Turin leaves City potentially facing another very tough last-16 tie. If Pellegrini's side do finish second they will hope Chelsea and Manchester United do not top their respective groups, because if they did it would reduce the number of clubs they could draw - increasing the chance of meeting the trio mentioned above. Paul Pogba (10) drove forward deep into Manchester City's half to create Mario Mandzukic's (17) volleyed opener. Paul Pogba or Yaya Toure? Juventus' Paul Pogba and Manchester City's Yaya Toure started in similar attacking midfield roles. Both are key players for their teams but it was former Manchester United player Pogba, 22, who looked the more capable of having a positive contribution. A sublime flick by the France midfielder almost created the opener for Juve, before he started the move for Mandzukic's winner. Toure's passing accuracy was actually better than Pogba's but it was the latter's dynamism that caught the eye with the 32-year-old Ivory Coast international dropping increasingly deeper. Patrice Evra became the second French player to make 100 Champions League appearances, after Thierry Henry. Manchester City finish their Champions League group campaign at home to Borussia Monchengladbach. They need to rely on Juventus not beating Sevilla and them winning to finish top of the group. In the Premier League, Manchester City entertain Southampton on Saturday. Match ends, Juventus 1, Manchester City 0. Second Half ends, Juventus 1, Manchester City 0. Attempt missed. Yaya Touré (Manchester City) right footed shot from outside the box is too high. Assisted by Nicolás Otamendi. Hand ball by Juan Cuadrado (Juventus). Attempt blocked. Yaya Touré (Manchester City) left footed shot from outside the box is blocked. Assisted by Jesús Navas. Corner, Manchester City. Conceded by Patrice Evra. Attempt missed. Juan Cuadrado (Juventus) right footed shot from the centre of the box misses to the right. Attempt blocked. Juan Cuadrado (Juventus) left footed shot from the centre of the box is blocked. Assisted by Stefano Sturaro. Substitution, Juventus. Juan Cuadrado replaces Paulo Dybala. Substitution, Manchester City. Willy Caballero replaces Joe Hart because of an injury. Corner, Manchester City. Conceded by Andrea Barzagli. Attempt missed. Raheem Sterling (Manchester City) left footed shot from the left side of the six yard box is close, but misses to the right. Assisted by Kevin De Bruyne with a cross. Attempt saved. Álvaro Morata (Juventus) left footed shot from the centre of the box is saved in the centre of the goal. Assisted by Stefano Sturaro. Jesús Navas (Manchester City) wins a free kick on the right wing. Substitution, Juventus. Patrice Evra replaces Alex Sandro. Corner, Manchester City. Conceded by Stefano Sturaro. Corner, Juventus. Conceded by Bacary Sagna. Bacary Sagna (Manchester City) is shown the yellow card for a bad foul. Jesús Navas (Manchester City) is shown the yellow card. Substitution, Manchester City. Raheem Sterling replaces Sergio Agüero. Attempt missed. Fabian Delph (Manchester City) left footed shot from outside the box misses to the right following a corner. Corner, Manchester City. Conceded by Giorgio Chiellini.